The Golden Retriever is one of the most famous dog breeds that is loved by many dog lovers. Not only well-known for its cute and outstanding appearance, the Golden Retriever is also adored by its obedient and trainable characteristics. Having a Golden at home could be a fun experience for dog owners and their families, especially when there are kids at home. Eight to ten weeks old is a pretty great time to bring your pup home as he can start to get adapt to the new home. 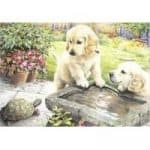 This article will show you some tips on how to take care of your Golden Retriever puppy as soon as he gets home at around 8 weeks old. FEEDING HUMAN FOODS IS A NO NO! Choosing good quality food for your dog is vital for his health and well-being. Dogs also need certain nutrition requirements, especially when they are growing at a young age. The rule of thumb is to obtain food that is rich in nutrients, and well-balanced for dogs. When you go shopping for dog food, pay close attention to the label to determine what kind of food it is and whether it is suitable for a Golden Retriever puppy. In fact, there are various products made for specific breeds such as Golden Retrievers. You can buy one of those products, which usually are purposefully made to provide sufficient nutrients for your dog breed. Another thing to keep in mind is that puppies have different nutrition needs compared to that of adult dogs. Therefore, it is important that you feed your Golden pup puppy food instead. A Golden Retriever puppy tends to eat really promptly based on his routine. Thus, it is necessary to establish a fixed schedule to feed your puppy. For a puppy that is less than three months old, you should feed him three times per day. Once he grows older, you can cut back to two meals per day. You may think that more food is better but in fact, small meals are easier to eat and digest, which helps with weight control and prevents bloating. Another benefit of feeding various meals a day is the psychological effect. Obviously your puppy would enjoy two bowls of food instead of one, thus he would feel happier eating when you feed him. When it comes to meal size, it varies from dog to dog. Some dogs eat more, and some dogs eat less. However, on average, an 8-week-old Golden Retriever would consume about one-third to one-half of cup of dry food per meal. You can start with one-third of cup first and see if it is the right amount for your pup. Then you can increase the portion gradually over time, but do not increase it out of a sudden. It is better to keep the portion unchanged for a while, then later add a little bit if needed. In addition to having a fixed time schedule to feed your dog, it is also essential to keep the feeding place unchanged and comfortable for your dog to enjoy his food. Dogs are sensitive creatures, especially puppies, so it takes time for them to get used to a certain place. Changing the place makes eating uncomfortable for your dog, and you may want to avoid that. Some people believe that any food that is safe for our consumption is also safe for dogs. In fact, it is quite the opposite. Some food that we love is toxic to dogs. For example, alcohol, chocolate, nuts, and a few others are poisonous to dogs. Their digestive system is not equipped like ours to digest those food. Therefore, feeding such food to your puppy may cause harm and sickness to him. To be safe, make sure that you don’t give your pup any of your food, if you are not sure whether the food is okay for your dog. If there are certain food that you want to feed your dog such as fruits or vegetables, it is always better to ask a vet before hand to determine if the food is good to go. 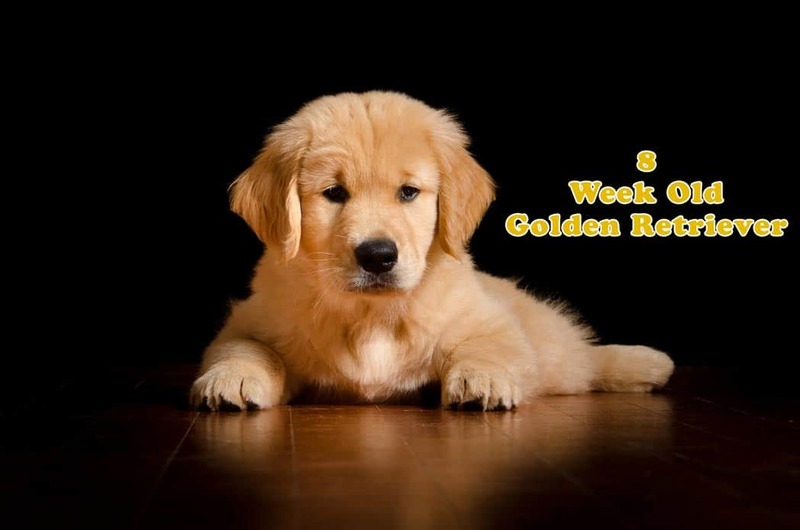 The first 12 weeks of your Golden Retriever is his critical socialization time. It means that during this time, you should pay close attention to your dog’s socialization. There are a few ways that you can do so. First, you can introduce your pup to your family and friends. The more people your dog meets, the more he gets to know them and develops his social skills. In addition to meeting other people, your dog also needs to be introduced to new things and other breeds of dogs. To do this, you can take your dog with you on a trip to a pet store or to a supermarket. Your puppy will get a chance to look at various different things. Regarding meeting other dog breeds, it is recommended that you take your dog to a weekly dog class. In this class, professionals provide training for your dog, and he will get the opportunity to meet and greet other dogs as well. In some areas, dog parks are available and lots of dog owners tend to take their dogs there but in fact, dog parks are not truly safe for your puppy. The first reason is that dog parks are usually packed with many dogs. Some of them are healthy, while some are not. Thus, it can be dangerous to take your puppy there as he would be prone to many unknown illnesses. Another reason is that too many dogs can be overwhelming for your puppy. Of course, not so many breeds are friendly, so dog parks are not an ideal place for his socialization. 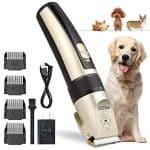 In short, while it seems to be a lot of work to take care of your puppy, especially when he is a Golden Retriever, it is actually rewarding because Goldens are cute and very obedient, and they love you as much as they can. The core thing is to be detail-oriented when taking care of your dog. Once you are used to it, everything will soon become a pretty a routine that you just need to follow without much thinking.